Business signs need to be up as quickly as possible. And nowhere is that more true than when companies re-brand or re-image their look. 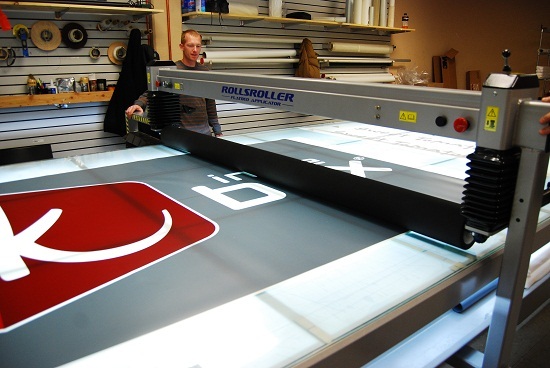 When faced with the possibility of changing out over a thousand new signs for Jack in the Box, CNP Signs & Graphics found a high-tech way to speed up the process with a large format flatbed laminator from RollsRoller, UK. This custom laminator measures 8ft by 16ft and allows CNP to lay vinyl images and graphics on to a clear plastic substrait without the typical problems of such a large signface. Historically, laying vinyl images on plexiglass or lexan involved using lots of soapy RapidTech spray and squeegee-ing the graphics into place. This resulted in a wet workspace and the potential for a skewed application. In the past, forming of the wet graphics had to wait until it had time to dry completely. The RollsRoller laminator, by contrast, is a completely dry process and eliminates many of the possible pitfalls associated with hand-set graphics.